With the assistance of Born Free, Bo and Bella, two rescued chimpanzees in Guinea-Bissau, will be moving to their new home at Sweetwaters Chimpanzee Sanctuary in Kenya today. The two young chimps are victims of the illegal pet trade. Although the critically endangered western chimpanzee is fully protected by law, the practice of keeping them and other primates as pets is common in West Africa. This is a secondary consequence of bushmeat hunting, since young are captured when their mothers are killed. Bella likely lost her mother to the bushmeat trade; she was just an infant when she was seized from a hunter in 2016. Bo, a young female, was seized from another hunter in 2015, and attempts to reintroduce her to the wild unfortunately failed. Both chimps have been held in very poor conditions since their rescues, as Guinea-Bissau does not have a rescue centre or adequate facilities for the care of great apes. Luckily, with the support of Born Free and with the assistance of researcher Maria Joana Da Silva, Guinea-Bissau’s Institute for Biodiversity and Protected Areas (IBAP) will be relocating the two chimps to a sanctuary in Kenya. 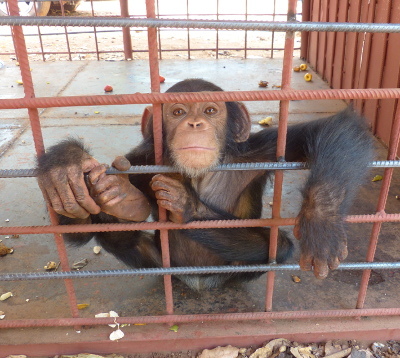 This will be the first ever transfer of a non-human primate in Guinea-Bissau to a sanctuary. 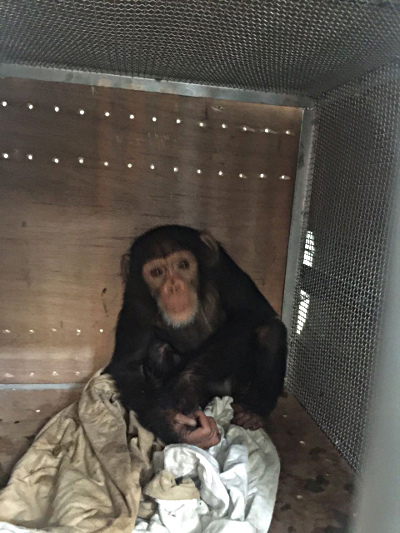 The relocation of chimps is always fraught with difficulty, and this time was no exception! Before the relocation could happen, both chimps needed a full medical check-up by a specialised veterinarian. Stool, blood, and skin samples were collected for analysis in a specialised laboratory abroad, and the chimps were checked for parasites, Ebola, herpes, salmonella, and other conditions. Once Bo and Bella were confirmed as healthy, the team had to request import and export permits from the Convention on International Trade in Endangered Species of Wild Fauna and Flora (CITES). Western Chimpanzees are listed as Appendix I on CITES; this is the highest level of protection, banning all international trade. Once the permits were acquired, the team set to constructing air transport cages that comply with the rules for transportation of live animals, as well as temporary transition cages for the chimps to stay in until their trip. Finally, after all these steps were completed, airline tickets could be purchased. The entire process took about two years. Although the process was long and difficult, it will be worth it: Bo and Bella will soon be roaming the 250-acre natural enclosures of Sweetwaters Chimpanzee Sanctuary in Kenya, with the 36 other orphaned or rescued chimpanzees residing there. The pair will depart for Nairobi today, on the 25th of April – the day of the Portuguese revolution – also known as ‘the day of freedom.